Becca is our new, rock-star, Star Wars expert, Oscar Wilde quoting, video game connoisseur, Receptionist/Office DJ. 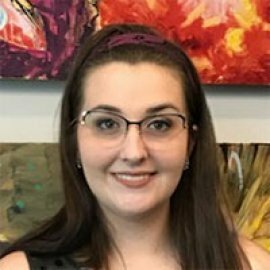 Two amazing things about our new, rock star receptionist, Becca Edwards – she nailed our (quite intentionally) complex application procedure, apparently with ease; and she subsequently interviewed so well we didn’t hold the fact that she only graduated from college in 2017 against her. Yes, Becca is now the youngest member of our staff by a few – well, never mind, but, as they say, she is an old soul. An English major at Campbell University, she brings her impressive familiarity with the classics, particularly those of the Edwardian and Victorian Ages, coupled with her love of Joyce Carol Oates, and the rare ability to quote Oscar Wilde at will, to our reception desk. Becca further impressed with an all-important, deep, knowledge and appreciation for ‘80’s music. She voluntarily added ‘Professional Office DJ’ to her list of responsibilities. Becca’s not much of a sports fan – she calls herself a “Super Bowl Football Fan” – but as she used to teach the use of rhetorical devices to high school students, she’s in a perfect position to render judgment on certain office sports . . . discussions. Becca is a gaming enthusiast, particularly RPGs. She is a newlywed, she claims that is purely coincidental that her husband, James, works for Epic Games. Becca and James put down the controllers quite often to get outside and hike in the mountains.